In this section, you’ll find out more about wellbeing – what affects how we feel and function, and why measuring it can be important for your organisation as well as the people you support. could help the centre improve its services. So Julie decides to ask some more people at the centre about their experiences. It isn’t just about how things look from the outside, it’s about how we feel in ourselves. It’s how we experience life – quality of life, good physical and mental health, and being part of our communities. It’s about how external conditions affect our lives and how we function in society. What affects wellbeing is different for everyone. So, no matter how many positive things we have in our lives, if we don’t feel or experience our lives going well, we can’t describe them as truly going well. 2. What affects our wellbeing? how we experience our lives – for example feeing supported or getting therapy. Our wellbeing fluctuates depending on what is going on in our lives. Lots of elements in our lives come together to affect our wellbeing, from our feelings and abilities to outside factors. For example, better self-esteem or support from family could be the key to someone finding a job. This, in turn, makes them feel happier about their life. How we feel physically and mentally is one of the most important factors for our overall wellbeing. Close relationships – with family members or friends – and having someone to rely on are very important for wellbeing. Having wider relationships in society can also make a difference – for example with neighbours you can talk to and trust. On the whole, having a job is good for wellbeing. Being in a ‘high quality’ job is even better. These tend to be jobs which provide people with things like job security, good relationships with colleagues and some control over how they work. This has a big effect on wellbeing for people living in poverty. But as income increases, and covers basic needs, it becomes less important for improving our wellbeing. Being in debt can be stressful and debilitating, and can have very negative effects on wellbeing. Different activities can affect our wellbeing – from physical exercise to taking part in music or art. And how we feel when we do an activity also matters. For example, giving to others or learning something new can give us a sense of purpose, which has a positive effect on wellbeing. Some of these activities have a big impact at the time we do them – others have a longer-term effect. The impact an activity has can depend on how we do it and who with. For example, getting to know others better, can have added benefits. Or for some people, doing an activity alone might be better. Where we do our activities matters too. For example, being in nature can reduce stress. There is no one answer: our genetics, our childhood environment and adult circumstances all contribute. Our physical and mental health, our relationships, our ability to influence our lives, where we live and how we spend our time all play a role. The importance of each of these is different for different people. We do know that most of these aspects have a smaller influence on our wellbeing the more we have. For example, £10 makes a much bigger difference to someone on minimum wage compared to someone already earning £35k a year. And having one more friend to rely on makes a bigger difference to those with no one than someone with over 20 friends in their close network. No one of these factors will make us completely happy if another important factor is missing. In short, a balance is important. Go to the resources section of the What Works Centre for Wellbeing website to see more of the research and read some evidence summaries on what can make a difference to people’s wellbeing. 3. Why measure changes to wellbeing? having opportunities and a sense of purpose. And these things could be central to your mission, or side effects of your work for the people you support. Even if your work isn’t about improving wellbeing specifically, you may be doing it without realising, or think it’s too obvious to measure. Whether you help people access a park, get fit or get a job, ultimately, your work is about improving how people feel about their lives. It’s a good idea to measure your full impact so you find out how else you can make a difference. Measuring wellbeing is no longer seen as ‘a bit fluffy’. Huge progress in the science of measuring wellbeing means that governments, academics and funders now see the measures as meaningful and effective. You probably capture objective data already – such as how many people in your job club find work. But to measure wellbeing fully, you need to look at subjective data too. For example, if someone is more confident about finding a job because of your support. By measuring all of these factors, you can show the full impact of your work on people and communities. And discover what else you need to do to achieve your ultimate goals. Wellbeing is a great way to share stories about how your work helps. For example, if someone found work partly because you gave them confidence for the interview, this human, relatable side of the story will engage people more powerfully than a statistic. Many funders and commissioners want to improve wellbeing with their grants. So if you can prove you can do that, they may be more likely to engage with you. Measuring your impact on wellbeing will also help you show how your organisation fits into the bigger picture of national priorities, and how all levels of society can work together. One way to improve wellbeing is to look at what’s already going well rather than what’s wrong – an asset-based approach. For example, highlighting and building on the great relationships or skills in a community rather than trying to reduce antisocial behaviour. 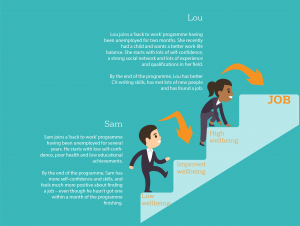 Wellbeing provides common ground for otherwise different programmes and projects. So measuring it is a useful way to compare activities that are run by different organisations, used by different types of people, or with different aims. 5. How does wellbeing link to your other aims? Lou joins a ‘back to work’ programme having been unemployed for two months. She recently had a child and wants a better work-life balance. She starts with lots of self-confidence, a strong social network and lots of experience and qualifications in her field. By the end of the programme, Lou has better CV-writing skills, has met lots of new people and has found a job. Sam joins a ‘back to work’ programme having been unemployed for several years. He starts with low self-confidence, poor health and low educational achievements. By the end of the programme, Sam has more self-confidence and skills, and feels much more positive about finding a job – even though he hasn’t got one within a month of the programme finishing.